Three photos of Eichler's X-100 from late 1956: interior gardens and living room area (above), front door entry (middle), and its stunning kitchen with dining table that slides open for at-the-table cooking (top). It’s made of steel, not plastic, and it was built in San Mateo Highlands—not Disneyland. But Joe Eichler’s X-100 ‘experimental research house’ from 1956 was on the same mission as Monsanto’s House of the Future. 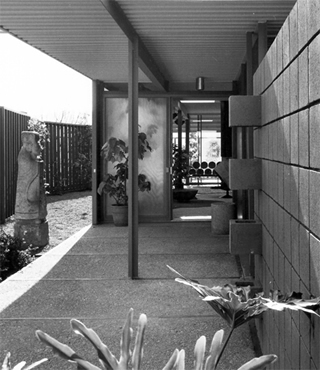 Its goal was “testing new design concepts, new materials, and new techniques of construction,” as Eichler’s brochure proclaimed, while accomplishing the more prosaic chore of marketing the company’s everyday wares. “The idea of the X-100 was mine, and it was done for promotion” of homes in the Highlands subdivision, Ned Eichler, Joe’s son and the firm’s marketing manager, said in a 2008 interview. The X-100 was designed by architect A. Quincy Jones, who clearly saw steel as more than a gimmick. 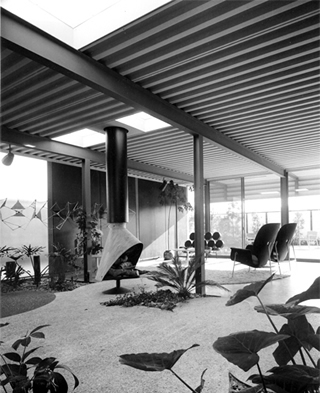 He had earlier designed a steel house for himself in Los Angeles. The X-100 reflects a gentler future than the Monsanto House. It’s not nearly so strange. 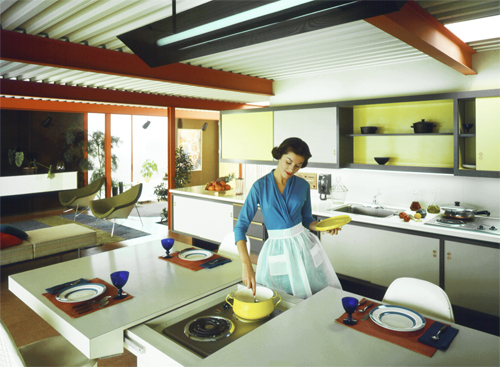 Unlike the House of the Future, the kitchen of the X-100 does not propose the use of gamma radiation. But there are marvels galore in the X-100, including a hygienic-white dining table that slid open to reveal burners for cooking or keeping food warm while dining; movable track lighting, unusual for the time; walls treated with plastic for easy cleanup; compact, paired bathrooms with a sunken tub; and a master bedroom separated from living areas by a motorized curtain. The name of the house may have evoked an experimental spacecraft, but there is nothing flying saucer-like about the X-100. In fact, in many ways, the future foreseen by the X-100 looks much like the mid-century present that Eichler was already building. By contrast, despite walls of glass, the House of the Future isolated inhabitants from the landscape by arranging the living areas on a pedestal high above the ground. Although Eichler concluded steel construction was too expensive for building tract homes, the X-100, its nomination pending for the National Register of Historic Places, remains occupied today—and fits nicely into its neighborhood of less futuristic Eichlers.